Updated November 4, 2016 – Phonak’s Exélia Art hearing systems are highly advanced devices designed to deliver hearing to those with mild to profound hearing loss. These Phonak hearing aids deliver exceptional performance, connectivity to other devices, as well as a variety of color and style options. The Exélia Art series provides users with 15 styles, which range from tiny Custom-In-Canal (CIC) hearing devices, to a variety of standard and micro Behind-The-Ear (BTE) devices. EchoBlock: An advanced technology that allows for easier hearing in echoey environments. This allows the user to have easier conversations no matter the environment. SoundRelax: This technology eliminates annoying, unwanted sounds in the user’s environment. Sounds like fans, motors, and other unwanted noises are reduced, allowing users to his or her attention on whatever they like. Real Ear Sound: This technology provides those with hearing loss with better sound orientation. It mimics the way the ears naturally work, by providing the user with more natural sound location in his or her environment. WindBlock Management: This is a sound-reduction technology specifically focused on reducing the annoying sound of wind in the user’s hearing device. Eliminating this wind sound allows for a much pleasurable environment outdoors. NoiseBlock Processing: This sound-reduction technology allows users to hear better in environments with large amounts of background noise. With background noise being reduced, the user can better focus his or her attention on conversations with friends and family. SoundFlow: This technology allows users to move seamlessly between different hearing environments. With this technology, the user can move from a quiet environment, to a loud environment, without having to make any volume or program adjustments to the hearing device. VoiceZoom: This dual-microphone technology developed by Phonak allows for much easier conversations in noise. It blocks out unwanted background noise, and emphasizes the voice of the person the user is having a conversation with. SoundRecover: This advanced technology brings back high-frequency hearing to those who may have lost it. This allows users to experience a fuller, broader spectrum of sound. This allows for improved speech understand, as well as increased enjoyment of music and nature. ZoomControl with DirectTouch: This provides the user with the ability to choose where he or she focuses hearing. This can be done either manually, or with the myPilot accessory. WhistleBlock Technology: This is a feedback-reduction technology that allows for more enjoyable conversations, the phone especially. In some hearing devices, feedback from the telephone causes an annoying whistling. With WhistleBlock Technology, however, this whistling is eliminated. DuoPhone: An advanced technology that allows for much easier hearing on the telephone. With just the push of a button, DuoPhone technology allows the user to hear his or her conversation in both ears at the same time. QuickSync: This allows users to wirelessly control multiple hearing systems with just one touch. 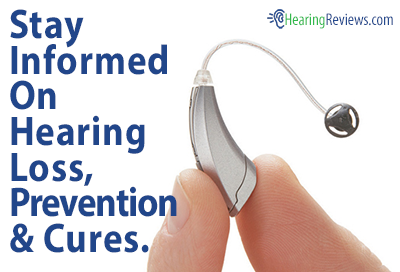 An adjustment to the volume or program of one hearing aid automatically results in the change in the opposite. Acoustically Optimized Venting: This feature, available for custom products, or some Behind-The-Ear wearers, provides the user with less occlusion of his or her ear, making the hearing device more comfortable to wear. Not all of the technology listed is available in every Exélia Art hearing device. Outlined below are the various Exélia Art hearing aids, as well as their featured technology. Exélia Art micro Petite: A BTE hearing device designed for those with mild to moderately-severe hearing loss. Exélia Art micro: A BTE hearing device designed for those with mild to moderately-severe hearing loss. Exélia Art M: A BTE device designed for individuals with mild to moderately-severe hearing loss. 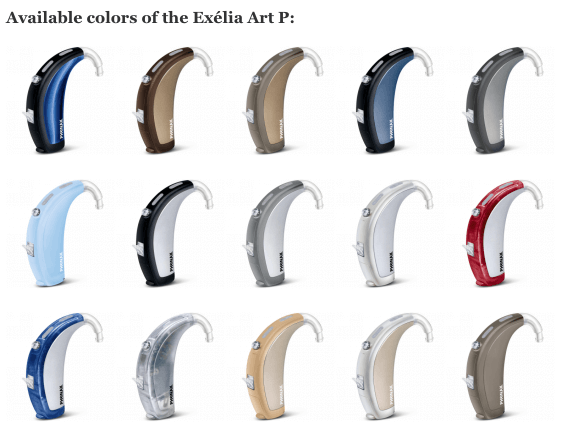 Exélia Art P (Power): A BTE power model hearing aid designed for those with moderate to severe hearing loss. Exélia Art SP (Super Power): A BTE power model hearing aid designed for those with moderatel-severe to profound hearing loss. 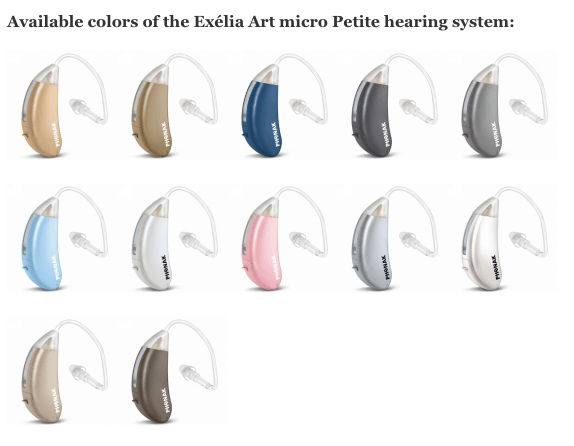 This Phonak hearing aid comes in the same colors as the Exélia Art P shown above. Exélia Art CIC/MC (mini-canal) Petite: A discreet hearing aid designed for those with mild to moderate hearing loss. It is non-wireless to deliver the smallest size. 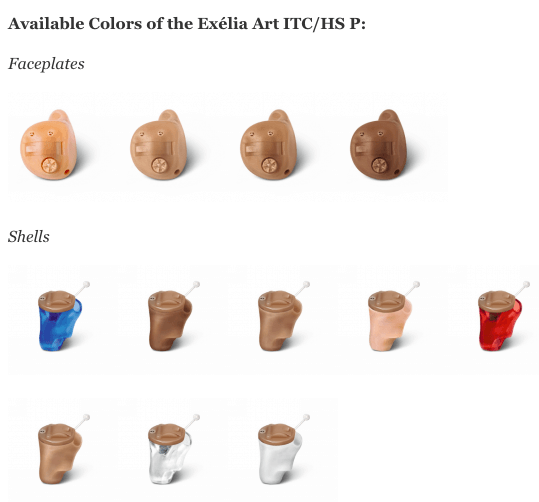 Exélia Art ITC/HS Petite (VoiceZoom): An In-The-Canal/Half-Shell hearing device that is designed for those with mild to moderate hearing loss. It features directional microphones, and is non-wireless, for its small size. 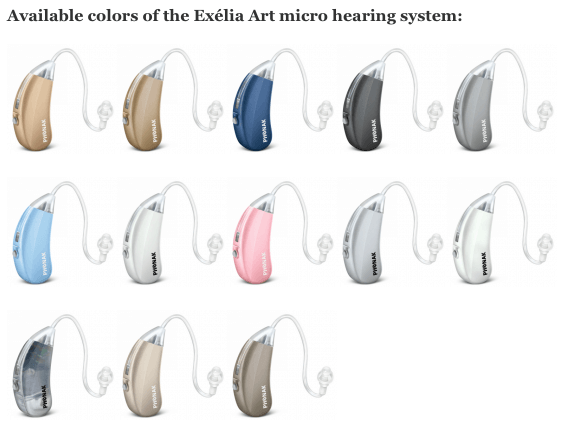 This hearing aid comes in the same colors as the Phonak Exélia Art CIC/MC Petite shown above. Exélia Art ITC/HS P: A power model In-The-Canal/Half-Shell hearing device designed for individuals with moderate to severe hearing loss. Exélia Art FS: A Full-Shell hearing device designed for those with mild to moderately-severe hearing loss. This wireless-enabled device features directional microphones. Exélia Art FS P: A power model Full-Shell hearing aid designed for those with moderate to severe hearing loss. It is wireless-enabled, and features an omnidirectional microphone. 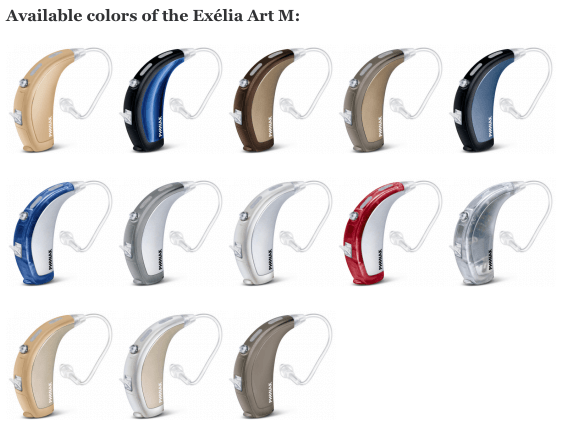 This Phonak hearing aid is available in the same colors as the Exélia Art FS shown above. Exélia Art FS P (VoiceZoom): A power model Full-Shell hearing device designed for individuals with moderate to severe hearing loss. It is wireless-enabled, and features directional microphones. 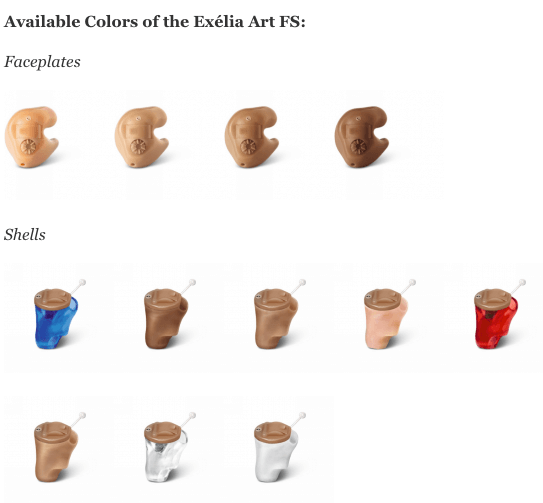 This Phonak hearing aid is available in the same colors as the Exélia Art FS shown above. iCom: A communication interface that allows users to wirelessly connect their hearing devices directly to his or her television, radio, MP3 player, telephone, or other electronic device. TVLink: A dedicated television-hearing solution that transmits the audio from the user’s television directly to his or her hearing device, in stereo sound. This allows users to watch television in stereo sound (both ears) at a volume comfortable for them. myPilot: A remote control with an LCD screen that provides users with access to a variety of functions, including status information on his or her hearing aid. This device allows users to make wireless volume and program adjustments to his or her hearing aid quickly, easily, and discreetly. KeyPilot2: This is Phonak’s smallest remote control for changing program settings and volume on the user’s hearing aid. inspiro: This is a Dynamic FM transmitter designed for teachers in regular and special schools. With the inspiro, the teacher’s voice is transmitted wirelessly to the student’s hearing aid, delivering enhanced hearing for the student. ML12i: This design-integrated MicroLink receiver designed to work with all of the Phonak micro BTE hearing instruments that use a 13 battery. 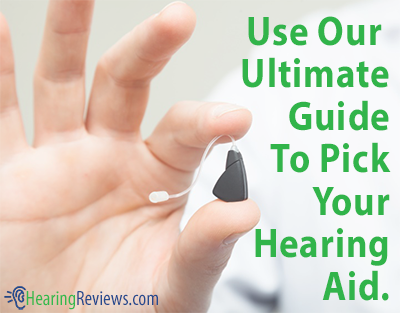 It allows audio from FM transmitters to be heard clearly in the user’s hearing aid.